Obviously there are many different types of workbenches, each having various merits and design features. Here is a shot of one of mine. 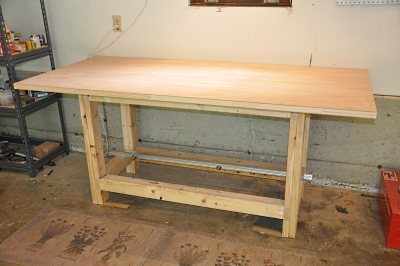 It is called a "Weekend Workbench" and the plans are available for purchase from PlansNow.com for $5.95. Main selling points... 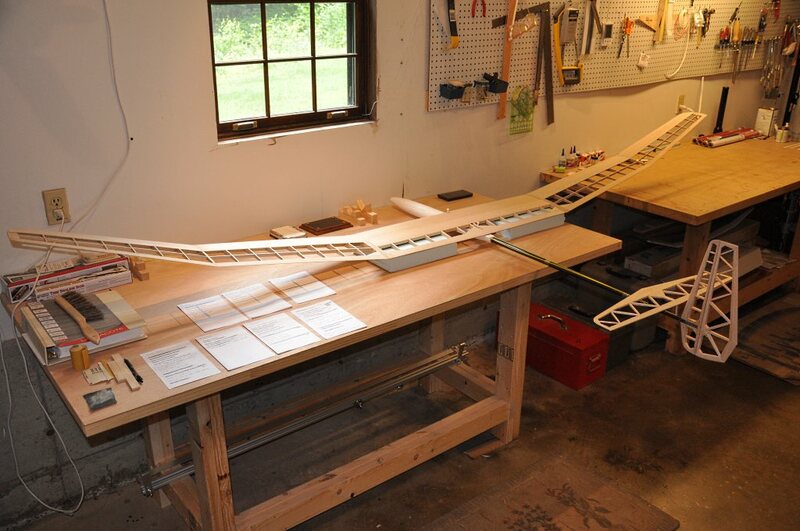 It's cheap, sturdy and easy to make. The top is actually a solid-core door that you can find at any home improvement store. I hunted around a bit until I found one in the damaged items section for $10 - it had a scratch on one side: big deal! I put plenty of my own scratches on it over the years! When I had need of more work surface, so I made a second workbench using the same design. The nice thing is that both benches are the same height, so they can be placed together for a continuous surface, or spread apart for two separate areas. Notice that I have a shelf placed in the one on the right, but not in the one on the left (at least at the time of this picture). The PlansNow.com plans provide details for a bottom shelf, as well as three pull-out drawers hanging under the table top, if you so desire.